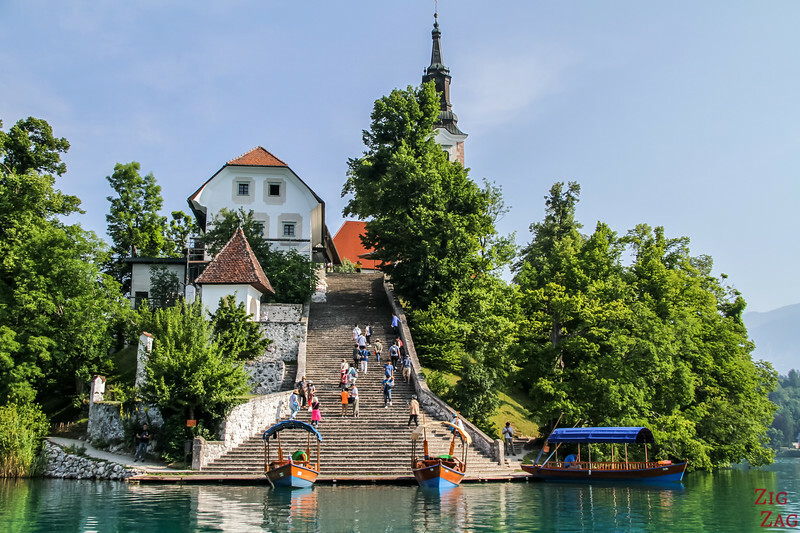 At the foot of the Julian Alps, that are many things to do in Lake Bled Slovenia. The Emerald lake is picture perfect surrounded by mountains, with its own cliff-hanging castle and small islet. It is considered one of the jewels in Europe. 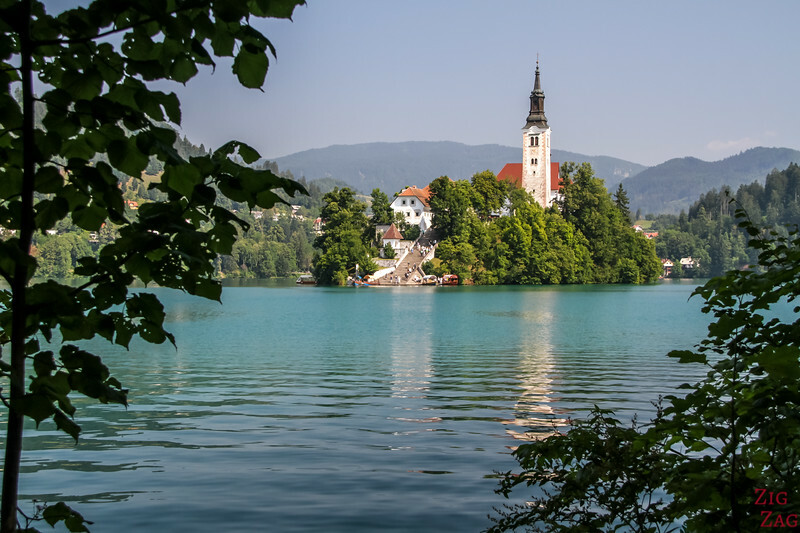 Let me help you plan your Lake Bled holidays with this practical guide full of pictures. 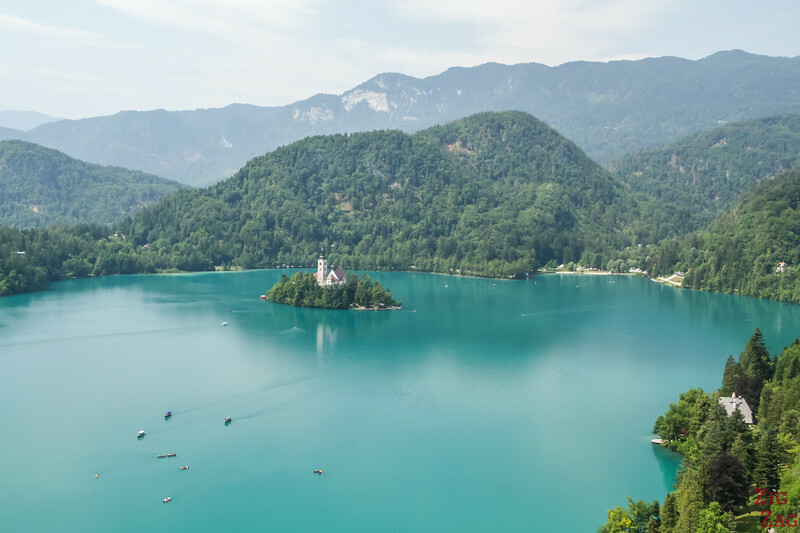 Why visit Lake Bled Slovenia? The color of the lake is between blue, green and emerald. It is quite mesmerizing! It has its own Castle established right on a precipice above the lake. You can compare rental price on rentalcars.com. 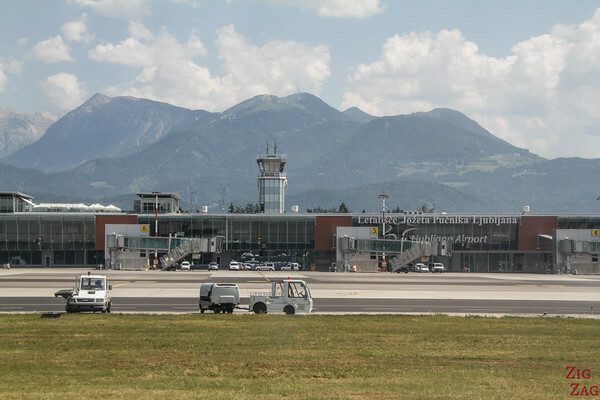 If arriving at Ljubljana airport, you can also get a taxi to Lake Bled. It is only a 30min trip. And once there, you can book tours and activities. Be aware! If you take a taxi from the line at the airport with the meter counter, it can be 2 to 3 times the price you get by booking one. 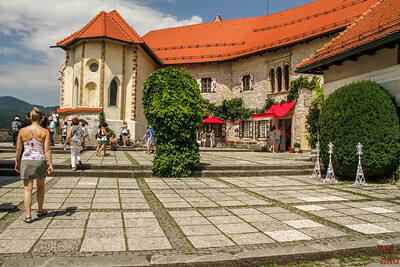 The Lesce Train station has frequent connections with Ljubljana but is 4.5km from Bled. 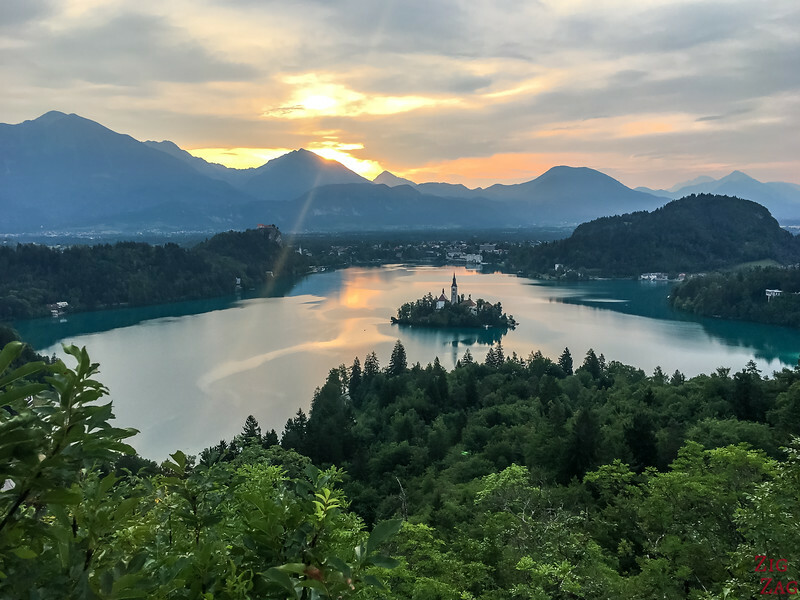 As you can see in the section below, there are many activities at Lake Bled and beautiful scenery to admire within 1h of the Lake or more. Those can be visited easily by car. 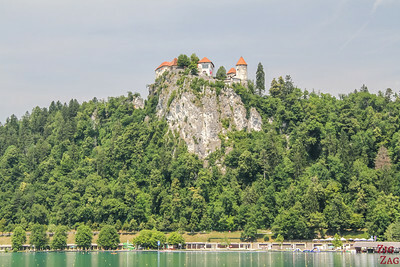 Otherwise excursions and trips are organized from Lake Bled as well. Bled is very close to the motorway and all roads around are in good conditions. Lake Bled is a beautiful destination all time around. In Winter in would be cold, but the frozen lake and the snow on the mountains is also quite a magical sight! Don't forget that you are in a mountainous region so it can rain in a valley and not in the next one. And in Summer expect thunderstorms at the end of the day! 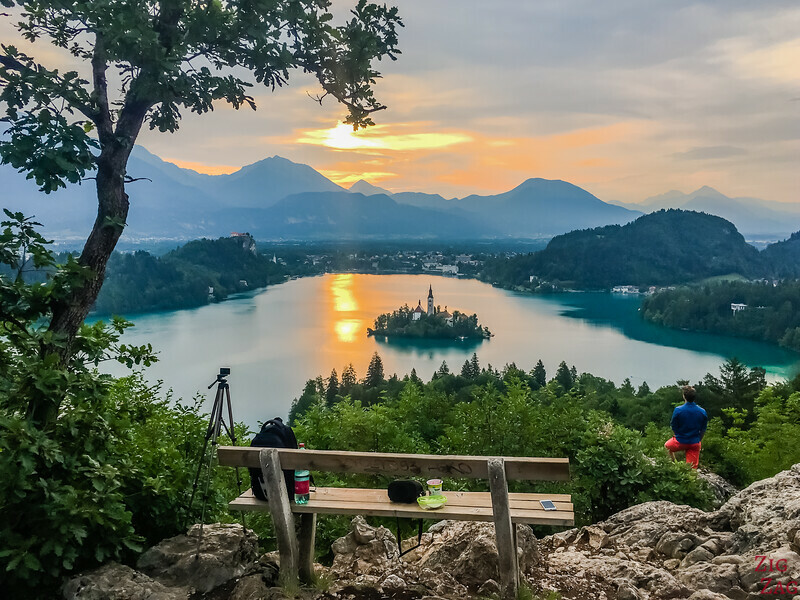 You can get an idea of Lake Bled in one day or stay for a whole holiday to explore the region and hike. 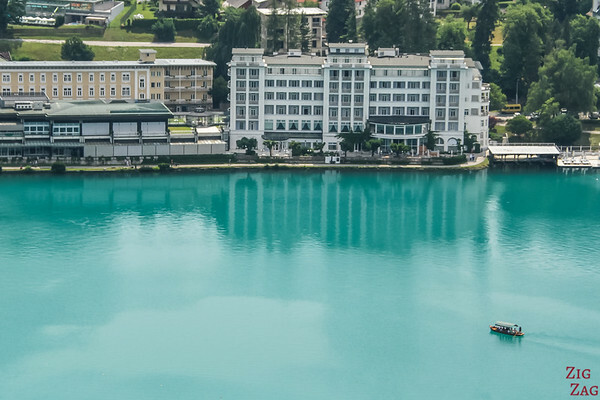 Let's start with what to do in lake Bled that are right by the shores of the lake or on the lake itself. I think one of the best things to do in Bled (and one of the best things to do in Slovenia) is to get up early to watch the sunrise. The Lake is a very touristy area. it gets crowded and noisy. Sunrise is the best time to see its majesty with the peace and quite and stunning colors. 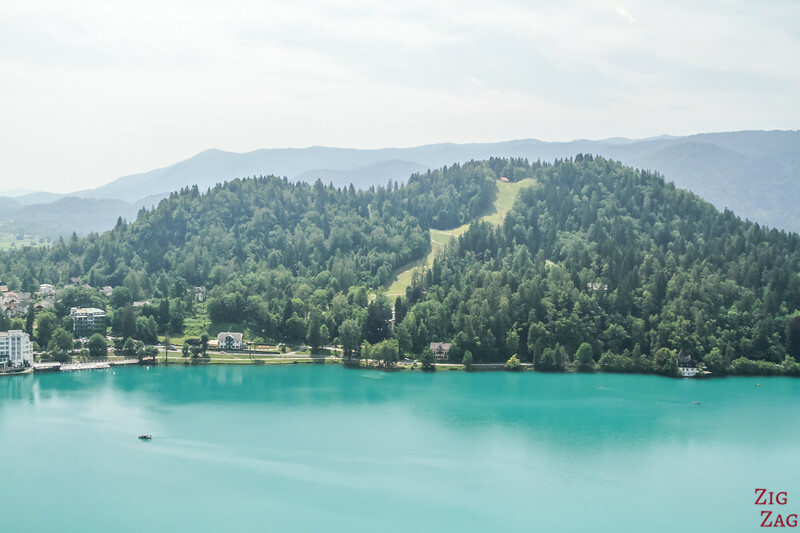 One of the best places to enjoy is is from the West end of the lake near the camping or climbing to the Ojstrica viewpoint for the view you have in the picture above. I know that in summer it means waking up at 4am or earlier, but it is worth it! Plan 1h30 to 2h to enjoy sunrise or picnic at the viewpoint - enjoy the view, no need to rush! You can climb up to the castle or take your car (parking for a fee at the top). Once inside you still have to climb slopes and steps. To be quite honest, the castle itself is not fascinating but the views of the lake are absolutely breathtaking! In Summer it opens early, so after your sunrise, enjoy a hearty breakfast and head to the castle before the crowds. In the morning your will have good light of the mountains across. Find a great spot by the shore of the lake and enjoy a swim or just watch the pletna boats (traditional boats) come and go. It is so relaxing! A classic things to do in Bled is to take one of those boats to visit the famous little island. It is quite expensive, and a bit rush once on the island. And it is full of tourists pushing to ring the bell of the church and have their wish come true. I think the island is not that fascinating but I really enjoy the boat ride with the amazing color of the water and views of the island and castle. Tours can be taken from different places around the lake. 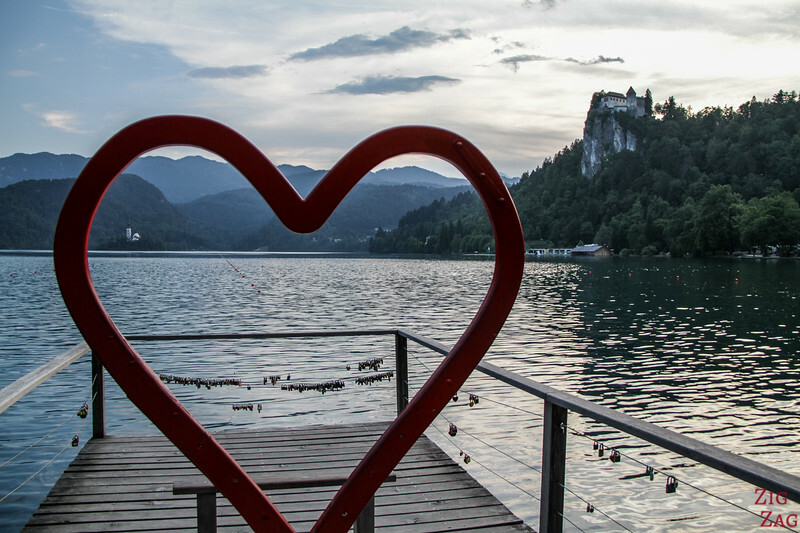 Lake Bled is famous for being a romantic place. So the heart shape at the East end of the lake is quite successful with visitors. It is located by the lake, in the town of Bled. If you feel like walking, you can do it all around the lake or just on a section. I particularly enjoyed the walking trail west of Mlino. You have great views of the island from there, and you are away from the road. On the hill across from the castle, just west of the town of Bled, you can find Straza. You can hike to the top or take the lift and then enjoy tobogganing down in Summer. Views are limited towards the castle because of the angle and the trees. There is an adventure park at the top with ziplining. I don't have specific places you can visit when it is raining. I just recommend to still get out and explore the region. The atmosphere when it is raining can be quite special and you never know when the rain will stop! West fo the lake, the hike starts not far from the camping entrance. After 25min of climbing quite a steep slope, you will reach one of the best viewpoints around Lake Bled: Mala Ojstrica. 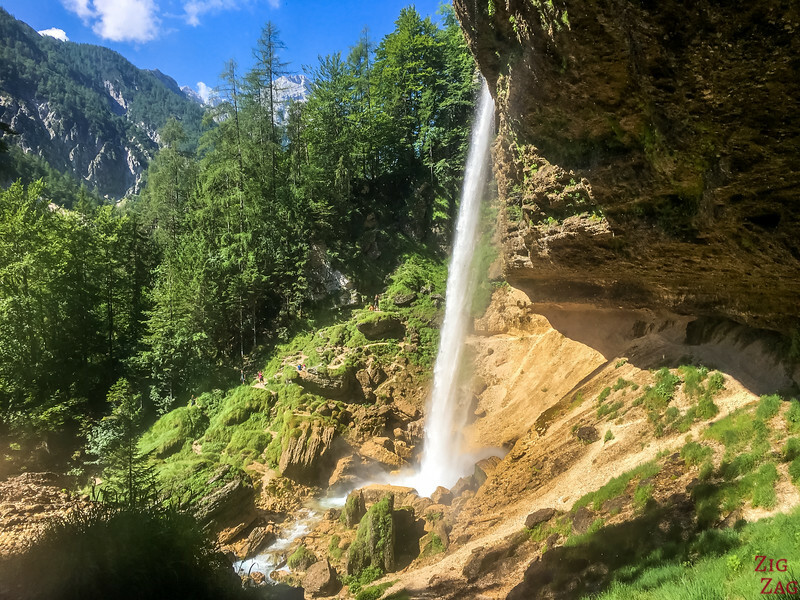 It is really worth doing this small hike near Lake Bled. I think it is the best viewpoint of the Lake. In the morning you can enjoy sunrise, and in the evening, you would have great light on the mountains and island. You can also keep hiking above to the Osojnica viewpoint but then the island is way smaller and the perspective is not as good in my opinion. As I wrote before, one of the main reason to visit the Lake Bled castle is for the views of the the lake itself. You can really grasp the color of the water and the surrounding mountains. And you have an unobstructed view of the small island and its church. A Superb view of Lake Bled! And if you don't want to climb or pay, I believe my number one choice on the shores of the lake would be at the beach near the camping, West of the lake. From there you have a views of both the island and the castle with the mountains in the background. 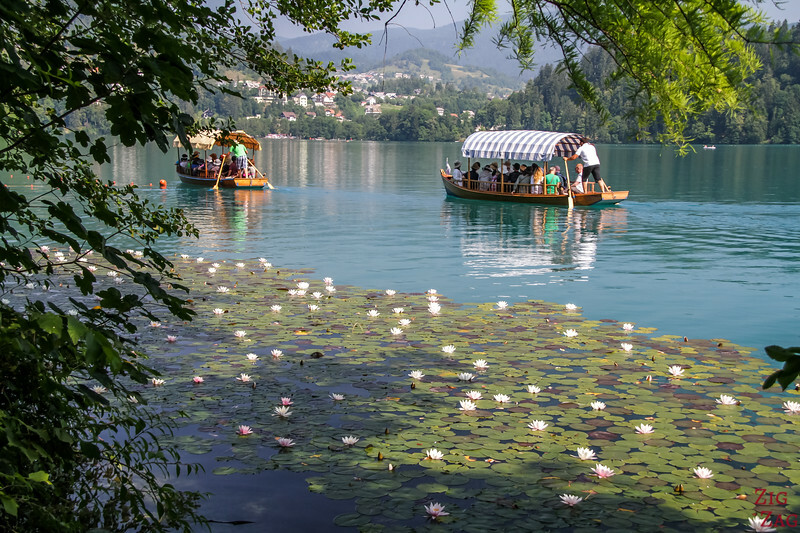 Want to see more of the beautiful nature around Lake Bled - Don't worry, there is much to do that is easy to access! 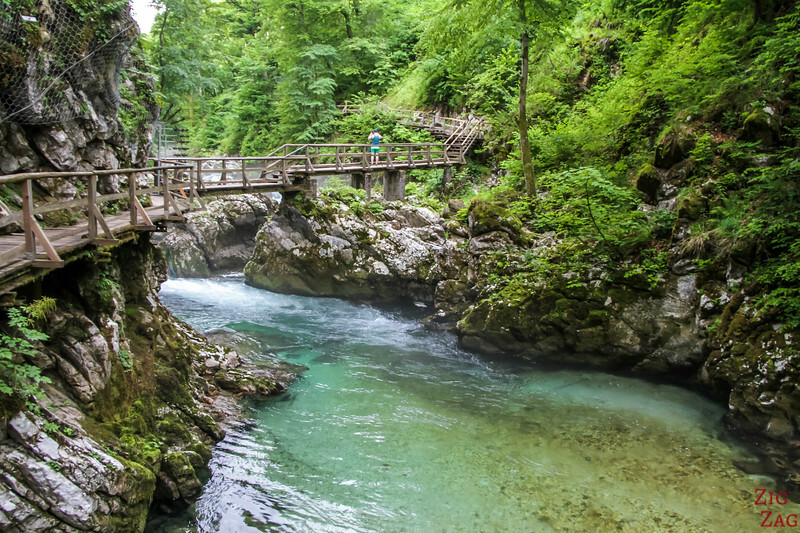 Vintgar Gorge is in my top 3 of things to do in Slovenia. I can't stress enough how you should visit early morning if possible, before the buses arrive so that you can have the views almost all to yourself. It is a stunning walk on a well maintained path that last 1h one way and you have to return by the same way. Note that it is closed in Winter. A very different gorge than Vintgar. The walk is wilder and way less crowded. Only a small section is narrow and offers interesting rock formations around crystal clear water. The rest of the walk is a peaceful experience walking in the dense forest. It is be great option when it is really hot outside. Lake Bohinj is the wilder brother of Lake Bled. A lot less building around this lake. And no castles. 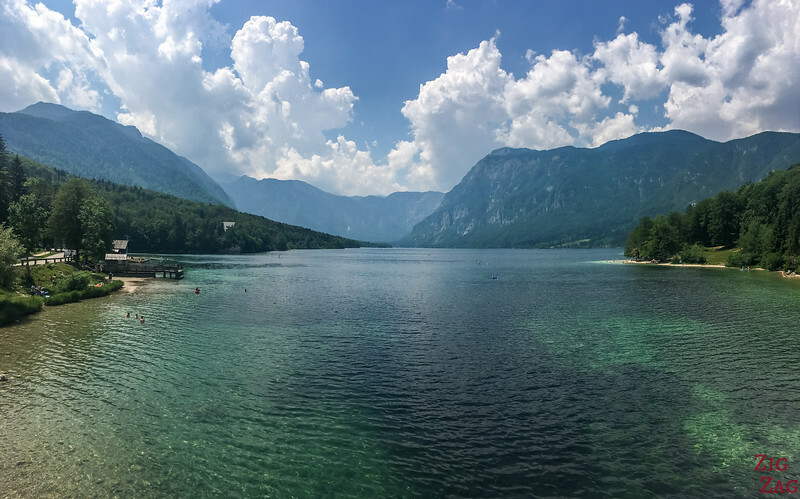 I heard many locals say they prefer Lake Bohinj to lake Bled and I can understand why. It does not have the special charm but it is not full of tourists and with a beautiful circus of mountain at the west end. I have stopped by the lake in many areas and it is always special. The view above is from the bridge near Stara Fuzina, when you first arrive at Lake Bohinj from lake Bled. Plan half a day to a day or several days! Towards the other end of lake Bohinj, near Ukanc, you can find the Vogel Cable Car. In Winter it takes you to the Vogel Ski resort to enjoy skiing or snowboarding. 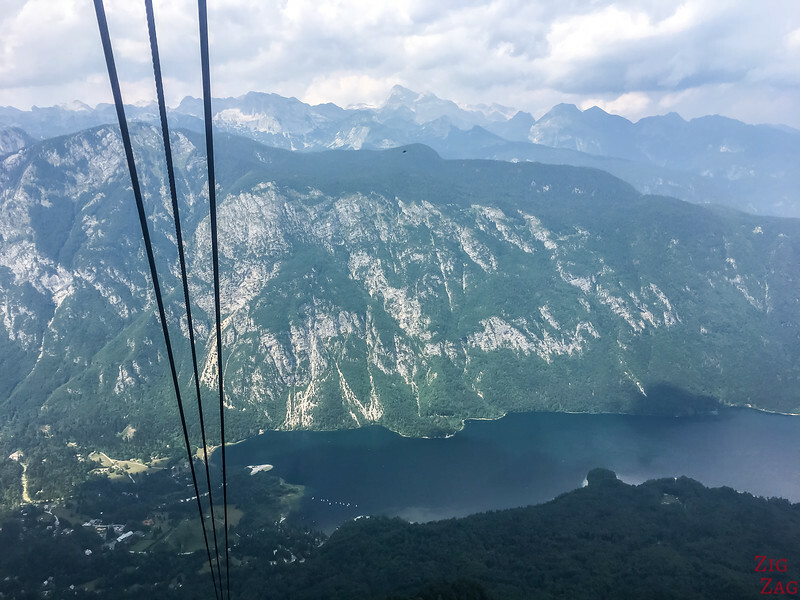 In Summer you will find hike departures or you can just enjoy the ride in the cable car because the views of the Julian Alps, the Triglav Summit and Lake Bohinj are unbelievable! But it is not for those subjects to vertigo. The climb is very steep! 1h30 or more if you want to hike. 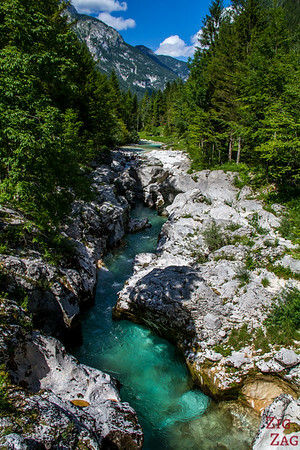 Savica is considered the best waterfall in Slovenia by many locals. It is one of the most visited attractions. It is not my favorite but it is definitively worth the climb of the 550 steps! 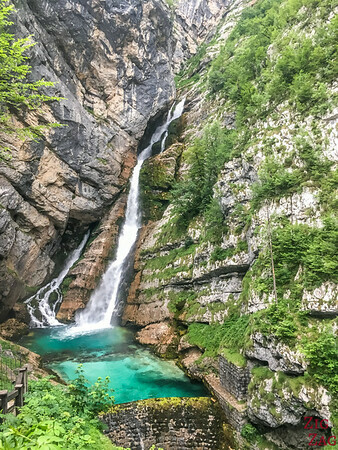 Located at the western end of Lake Bohinj, up in the mountains, the 1 shape waterfall gets out in the middle of the cliff from an underground river and drops in a sparkling emerald color pool. Check out my video and photos in my article dedicated to Slap Savica. Another waterfall not too far from Bled (but in the opposite direction) and worth an excursions is Slap Pericnik. A 10min steep hike takes you to his beautiful drop. The great part is that you can walk behind and enjoy views from many angles. Check out a video and many photos in my article dedicated to the Pericnik falls. And if you like longer hikes and staying longer, there are many many more especailly around lake Bohinj. You can also plan ahead, and discover other parts of Slovenia or the countries around. Since Slovenia is quite small, you can really cover a lot. You can of course spend the day in the capital city. It is only 45min drive away or your can easily take the bus in the morning and return in the evening in Summer. 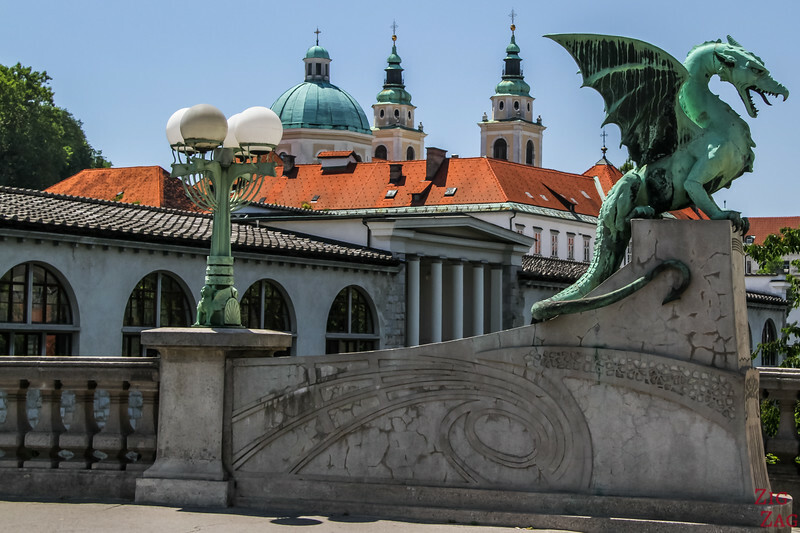 In Ljubljana you can enjoy the castle, strolling along the river, visiting the cathedral, admiring the dragon and bridges. And you could finish the day having the drink at the top of their building called Skyscraper which offers fantastic views of the castle and the mountains. Between Lake Bled and Ljubljana are 2 towns with charming medieval centers and castles: Kranj and Skofja Loka. I was very impressed by the museum inside the Skofja Loka Castle (that I enjoyed all by myself as nobody else was there). 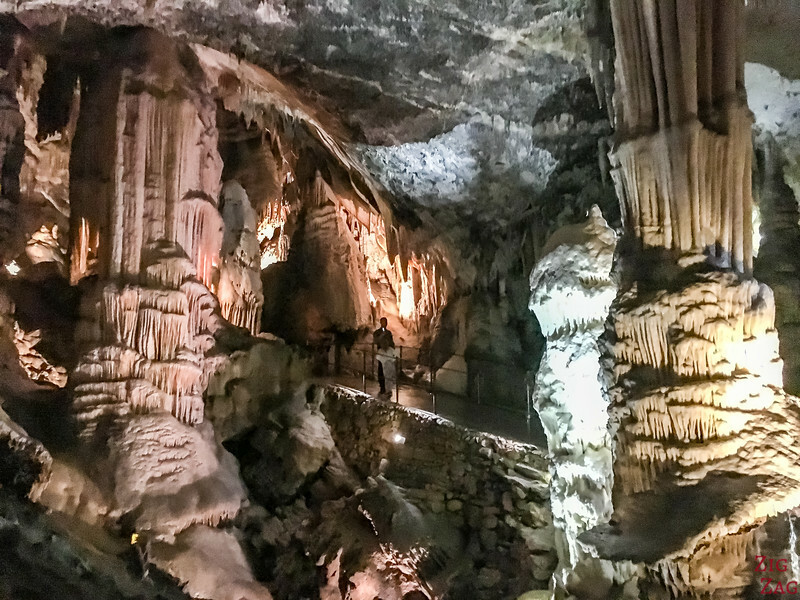 The famous Postojna caves are only 1h away from Lake Bled, driving on motorway almost the whole time. There you can take the train for 2km to enter the depth of those amazing caves and tunnels. Then you walk for 1h and come back with the train. Really feels like getting closer to the center of the Earth. ​Important Note - Book your access ticket in advance to make sure you have a spot at the time you want. After that you can drive 15more minutes to visit the Predjama Castle that has been built in from of a cave and is one of the best preserved in the world. Check out my article to see photos and get info. Have you heard about the Emerald River? Well it is the Soca river and the water really looks like emerald. Set up in a beautiful valley, it varies between wide open areas, where the color is lighter and more transparent and narrow canyons where the color is intense. It is stunning - and the road allows you to stop in many places to admire it from small bridges. One of my favorite regions in Slovenia is the Logar Valley and the surrounding valleys. Beautiful mountains and charming farm. It is such a peaceful environment! 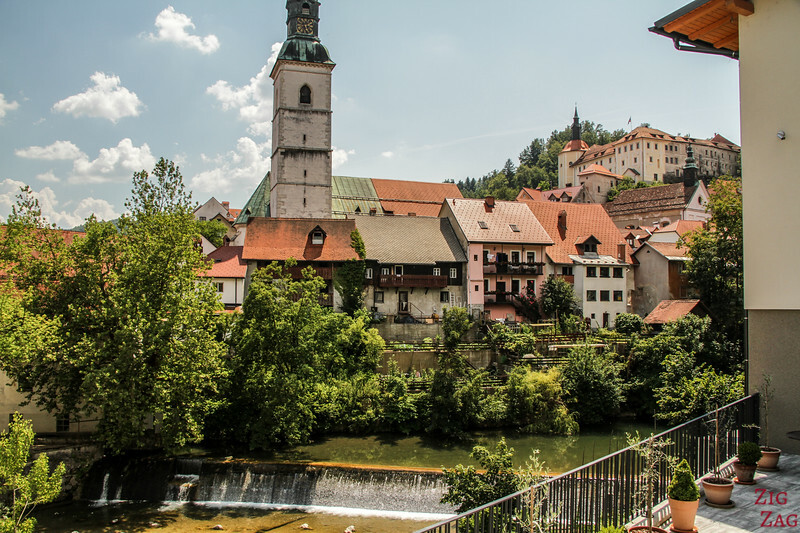 on your way you can stop at the town of Kamnik to enjoy views from the old castle - rooftops & Mountains. 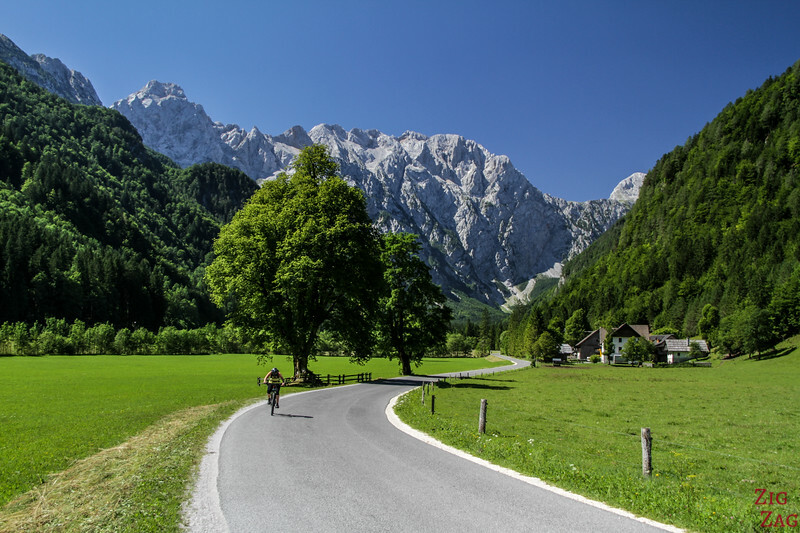 Then head to the Valley, enter Logarska Dolina and then take the small Solcavska Panoramic Road that will take you to a series of traditional farms. You can even head aboard to Austria, Croatia or Italy. 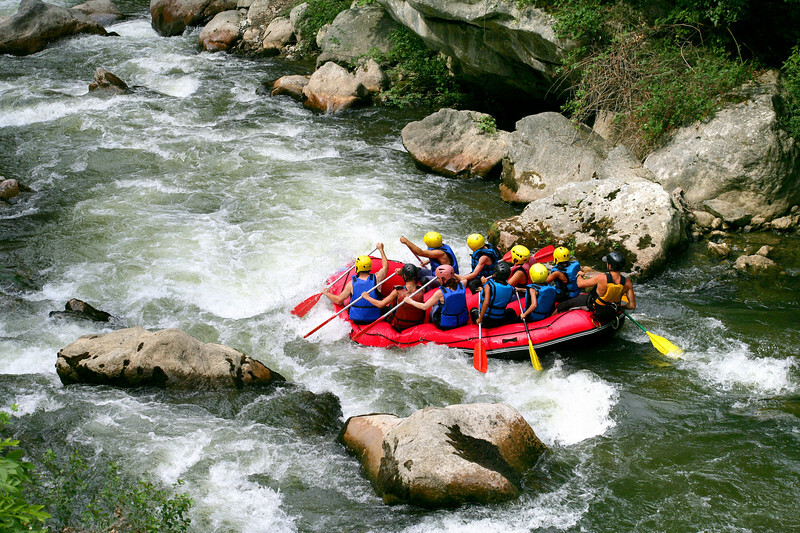 Rafting is really a big one in Slovenia - I have see many boats and offers. 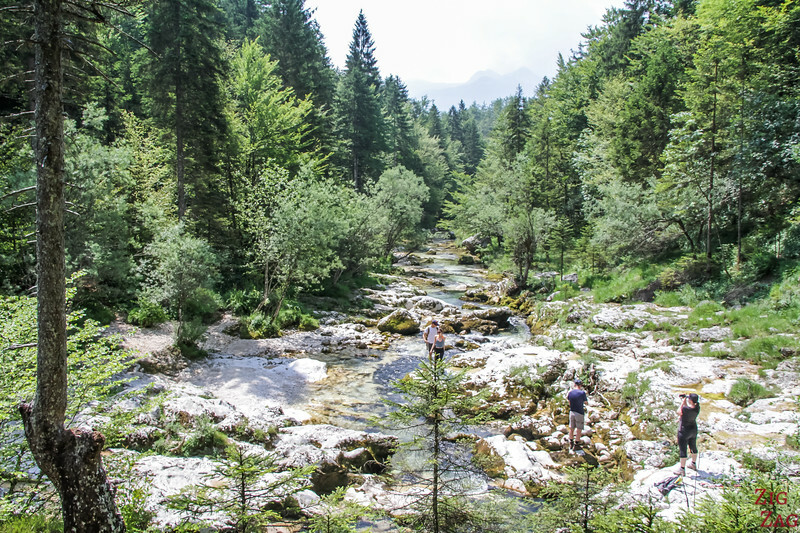 The center for those adventures is Bovec in the West of Slovenia, but even from Bled you can enjoy the pleasure of rushing down a river. That looks sooooo cool!!!!! I have not done it but I wish I did, combining the pleasure of Kayak with underground exploration, not something you can do everywhere! My 3rd option for you is to go canyoning. Don't worry, even if you have never done it, your can enjoy the adventure. Get in you wet suit and follow the guide to explore the canyon with natural slides, jumps and great gliding. 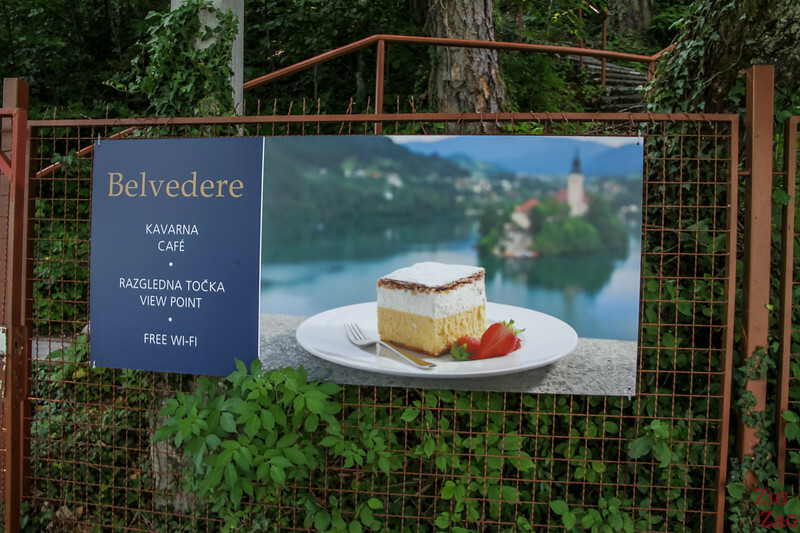 The easiest place to stay around Lake Bled is in the town of Bled. You have a great choice of accommodations (hotels, apartments, hostels...) and a lot of restaurants. Plus you are never far from the lake itself. I personally stayed at the Bled Apartments. It was a 10 min walk to the lake shore. The apartment was spacious and very clean, with parking. With the kitchen, we could make our own diner and the supermarket was just across the road. 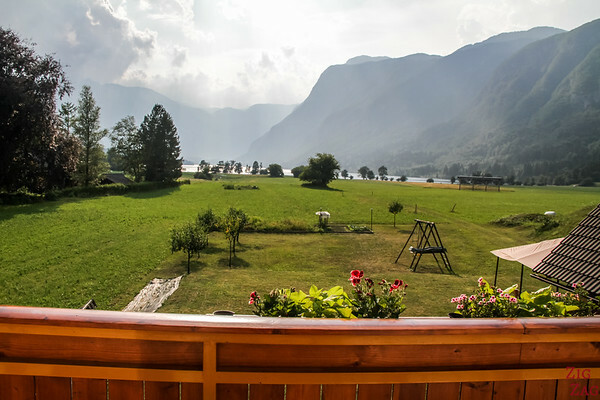 However if you have your own car and want a quieter area to stay, I recommend to stay near Lake Bohinj. 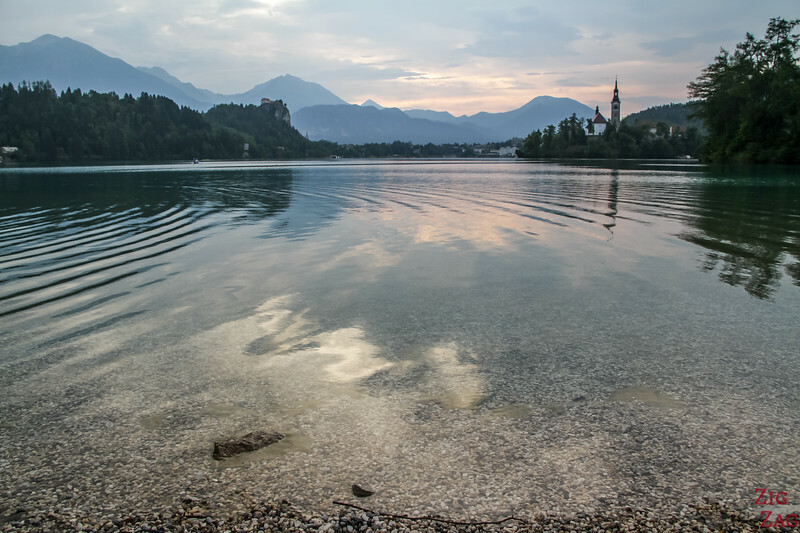 Bled is only 30 minutes away so you can enjoy its activities but spend more time in a quiet environment close to nature. If you don't mind the cold, Lake Bled is a great destination for Winter. The snow on the mountains make the scenery looks like a fairy-tale. And if you are staying there you can book a trip to a nearby ski resort to learn skiiing! - Check out program and book.